When a YouTube user now tries to comment on a video, a box pops up asking that person to start using their "full name" at the video sharing site. The "full name" is taken from the person’s Google+ account since Google requires the real name of someone signing up for a Google+ account. I'm not sure, I'll decide later. 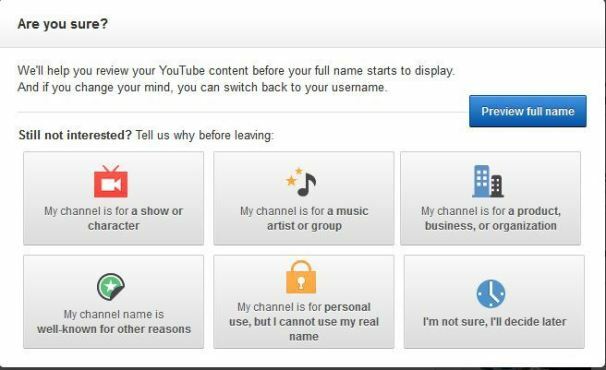 Google offers to help you review your YouTube content before your full name begins to be displayed on the service. It also makes clear that you can switch back to your username at any time. Whether this step will improve the discourse in YouTube’s comments section remains to be seen. People who leave constructive comments are likely to embrace the new policy, but others will continue to hide behind anonymity and revel in their vile comments. Google’s requirement that people sign up for Google+ is a policy one Google executive compared to a dress code for a restaurant. That characterization may be true for most YouTube users, but for social and political activists living in repressive regimes, the policy could be a ticket to prison or worse. That Google+ policy was eventually revised after Google was deluged with user complaints. That's not to say that Google isn't sensitive to the dangers some of its users face in the pursuit of social justice. For example, it recently added a feature to YouTube that allows people who post videos to the site to automatically blur out the faces of the subjects in their footage. In June, Google revealed at its developers conference that it was working on improvements in YouTube's comments section. So this latest development could be just a baby step in a longer strategy leading to a vast reduction of anonymous comments on YouTube. Such a reduction could take some liveliness out of the offering, but it could improve the site's appeal to businesses, which could contribute to Google's bottom line.